Antennae - (singular: antenna), sometimes referred to as "feelers", are paired appendages used for sensing in insects and many other arthropods. Claw - Claws are the final (furthest from the body) segment in the leg of an insect. Most insects possess two claws on each leg. 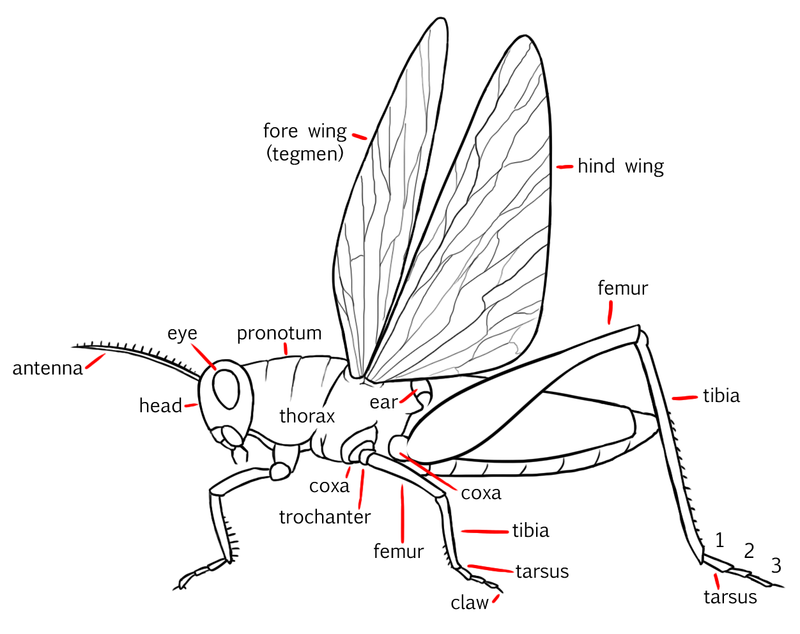 Coxa - The coxa is the first (counting from the body) segment in the leg of an insect. The coxa attaches the leg to the thorax. Femur - The femur is the third (counting from the body) segment in the leg of an insect. The femur is between the trochanter and the tibia. It is often the thickest or stoutest segment in the leg. Tarsus - The tarsus is the final segment (furthest from the body) in the leg of the insect. The tarsus contains five sections called tarsomeres and usually ends with one or two claws. Tibia - The tibia is the fourth (as counted from the body of the insect) segment in the leg of an insect and is located between the femur and the tarsus. In many species of insect the tibia is covered in spines and hairs. In bees, the pollen basket is found on the tibia of the hind leg. Trochanter - The trochanter is the second (as counted from the body of the insect) segment in the leg of an insect and is located between the coxa and the femur.